In a rare interview, Lynsi Torres, the 30-year-old heiress to the Orange County Irvine-based In-N-Out, spoke about the employment practices and company management involved in running one of the most admired fast-food chains in the nation. In-N-Out’s managerial approach has given In-N-Out a long-held reputation as an attractive place to work. This reputation has been bolstered by the salaries. New hires earn $10 an hour, and the company prefers to promote from within for management positions. In 2012, In-N-Out store managers made more than $120,000 on average. By comparison, the median pay for food service managers across restaurants nationwide is around $48,000 per year, according to the federal Bureau of Labor Statistics. Throughout its 65-year history, In-N-Out has grown at a deliberately slow pace while refusing to franchise its operations, which has helped it keep tight control over food quality, restaurant cleanliness and overall image. That trend of slow growth has allowed the company to remain committed to serve only high-quality, fresh food. 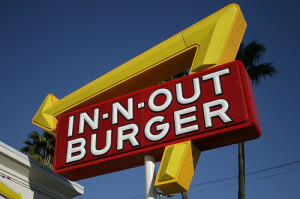 Since In-N-Out Restaurants do not have any freezers or microwaves, every new location must be within a short distance of its Baldwin Park or Dallas Distribution facilities. On top of ensuring the commitment to quality, Torres dedicates herself to making sure the inner workings of the company are a finely-tuned machine. Having grown up in the company, Torres had worked in a number of departments within In-N-Out, including human resources and merchandising, but had little experience managing day-to-day operations.